There are so many wonderful reasons to stitch needlepoint apples. With this apple needlepoint design, you'll be able to stitch Fuji, Granny Smith, and Red Delicious apples and turn them into beverage coasters that complement your home decor. They are quick and easy to stitch and will appeal to any skill level, from beginner to expert. Not only can the apple motifs be used as single designs; they can also be arranged in a group to create an entirely new needlepoint project. All you'll need to do is change the colors and shading for the types of apples. The best needlepoint stitches to use are tent stitches, which allow you to work as much detail as possible in shading and blending each color of the designs. Tent, Continental, and Basketweave are also the best stitches to use if you are trying to reproduce the curves and roundness of the apple pattern. Limit your use of fancy stitches. If you want a stylistic effect, choose additional stitch techniques that suit your needlepoint taste. Start in the center and work outward, filling in the background last. Try to minimize the degree of canvas distortion by mounting your canvas in a frame. Named after Mt. Fuji in Japan, these apples are a cross between the Red Delicious apple and the little known Virginia Ralls Janet apple. The 3.57-inch by 3.71-inch free needlepoint design is a striking rendition of this popular apple hybrid. With only 50 stitches wide and 52 stitches high, this fun design is just waiting to use up scrap threads in your needlepoint stash. Since every stitcher uses a different amount of thread based on how loose or tight the working rhythm, it’s hard to estimate just how much of any one color will be needed. Here's how to make the best matches possible to the threads and fibers you already have on hand. 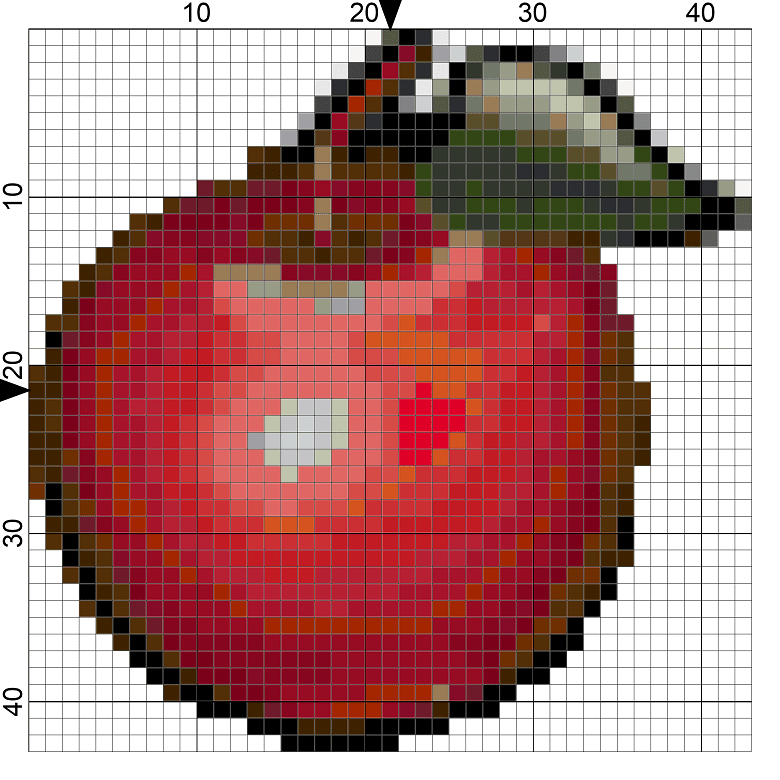 Download the Apple Needlepoint Pattern, enlarge it as needed and print in full color. Bring it with you to a fruit stand or supermarket and take a look at the colors in a real Fuji apple. Make notations of the shades of each color you want to use. Sort through your thread stash when you return home to match the colors. The Granny Smith needlepoint can be completed fairly quickly once you start stitching. You'll want to take a look at a real one to get the colors and shading right. Although there is a bit of shading, the needlepoint project is still a good design for a beginner to tackle. Experienced stitchers who want to try something new may want to experiment with blending as well as a few new needlepoint stitches. Feel free to use as many red shades as you desire when working this apple needlepoint project. You’ll want to use closely graded red shades from medium to very dark that move almost subtly from one shade to the next as you work the needlepoint project across the design area. Make sure to mark each shade so you don't get confused as you change colors.